According to the PBS Kids Reading Activity Calendar - the one that reminded us to celebrate Pandemonium Day yesterday - July 15 is Cow Appreciation Day. There's something about cows. Is it those big velvety eyes, fanned by long lashes? Is it the warmth and contentment you feel when you're watching their rhythmic chewing of the cud? Is it the pied beauty of their skin patterns, none of them quite the same? Why not read books with your kids today that celebrate cows? Here's a review of one called This is the Mud, by Australian author, Kathryn Apel. You could write a list of facts that you and your children think you know about cows, and check your facts online or at the library. Follow up with a list of what you would like to learn about cows. You could also take a trip to a farm and visit some real cows. To celebrate Cow Appreciation Day, I came up with a list of simple questions and answers and tried creating an arcade game at ClassTools.net where you can get free customisable flash templates to embed into blogs, wikis etc. Once I'd put my set of questions and answers in, I tried the game, and got the code to embed on my blog, plus a url. As you will see, there are five different choices of game, but all are built around my original ten questions and answers. Click on the blue words of Matching Pairs, Wordshoot, Flashcards, Manic Miner or Cannonball Fun to try the games below. There are other choices at ClassTools.net, all free, and I think they would make a great addition to a class blog or wiki. Winston Churchill said,"Odd things animals. All dogs look up to you. All cats look down to you. Only a pig looks at you as an equal." I think cows look at us that way too, and that's A Good Thing, right? Must confess that I do find other cow just a little bit scary though. I'm mooooved that there is a cow appreciation day - and that you linked to my muddy book. Oh, I love that quote of W. Churchill! And I do like the picture of that very pregnant cow. Yes, cows are sweethearts. A bit shy, but never inflicting any harm. I really like this post on cows! I actually like the smell of cows too. The fresh grass and warm skin smell, not the milking yard smell. I promise no more special days for a while. It's just these two appealed to my strange sense of humour. I loved them too, Paula. Quote and pic both. I'm off to read your story! Paula, if you're getting comments here, I tried four times to post a comment on your blog about the lovely farm in Italy, but it refuses to accept my word verification input. 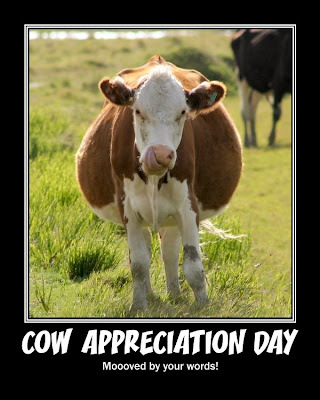 I had no idea such a day existed but I am delighted to start celebrating cow appreciation day from here forward! The kids will love the celebration. I'm so glad they will, Kelly!